Fire crews responded to a call for smoke coming from a building on Atkins Road. 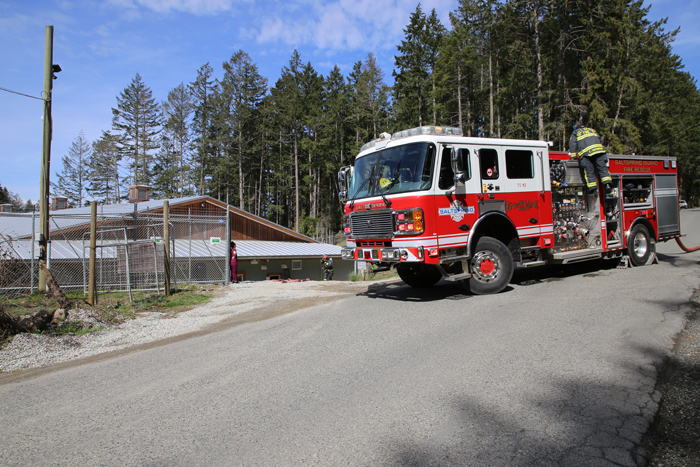 The Salt Spring Fire Department responded to a call for smoke in a commercial building at 186 Atkins Rd. on Thursday afternoon. The smoke was caused by an electrical malfunction in the HVAC system of the building. Fire crews laid down hoses to fight the fire, though Capt. Dale Lundy explained that the fire was mitigated after the occupants shut down the power to that part of the building. Atkins Road was blocked off to traffic both ways for around one hour on Thursday. Lundy said that the department would be conducting further investigation into the cause of the fire, but the building itself did not appear to have sustained any damage. “I think that was a textbook call for us. The occupants did everything they should be, closing doors and shutting down power, it just saves a lot of potential,” he said.